If you’ve been following me online, I’m sure you’ve noticed the dozens of doughnuts, hot dogs and hamburgers I ate on the road during The Edible Inevitable Tour. Well I’m about to do it again, this time for an all-new show called Eat Your Science (dates and tickets here). Since your recommendations were spot on (thank you), I’m asking you again: Where should I eat? In each city, I’m looking for coffee shops, restaurants, late-night snacks and sandwiches available in the area. Keep it local and simple…nothing fancy. If you know of a must-visit eatery or coffee shop in a city featured below, tell me in the comments, or on Facebook or Twitter. #ABroadeatssrq While in Sarasota, FL try something sweet from Cakes By Ron. Best cupcakes you can find…especially the Boston Cream! #ABRoadEatsSTL Must eat on the hill! Go to Adriana’s for lunch. Family owned Adriana runs the front and her kids and grandkids make the food. My favorite is the Sunny’s sandwich. Then go to Vitale’s Bakery get the anise cookies. Same rwcip5my grandmother used and I still use. Classic, simple delicious. Then go to Gelato De Riso. Homemade seasonal flavors. Enjoy! #ABRoadEatsMSP: Taco Cat! Taco Cat! Taco Cat! Totally original, downhome hip. Started by two guys with a late-night craving for tacos. And Matt’s Bar for a Juicy Lucy. Doesn’t get much more delicious and divey than Matt’s. #ABRoadEatsBWI So many great places to eat in Baltimore! Petit Louis in Roland Park: Super cozy french food. Green Onion in Hamilton- they make their own sandwiches, and the market is pretty great too. Winston and Cristin used to run a fabulous restaurant too, which I think has since morphed into a pop-up/catering biz, called Clementines. Faidley’s Seafood at Lexington Market (downtown) for crabcakes. We can’t get them anywhere else now, it’s just not the same. Ms. Shirleys: The best brunch we ever had. Joe Squared Pizza in Station North. Pizza is of course amazing, try the risotto as well. We also suggest Jaleo in DC and if you get over to Leesburg VA, you have to go to Melt and get a burger. Debbie is super nice and the food is amazing. Make sure you stop at Dallas Hot Wieners II, 490 Broadway, Kingston, NY a few blocks down from the UPAC where you are appearing on Thursday this week. The place is clean, neat and simple….you’ll love the hot dog. Give me a shout out that night if you liked it! #abroadeats I don’t see a specific hashtag for the Sarasota stop…But when you are here, you must have a donut from Gold Star donuts. #ABRoadEatsNASH, go try The Pharmacy. Amazing burgers and an authentic soda fountain. 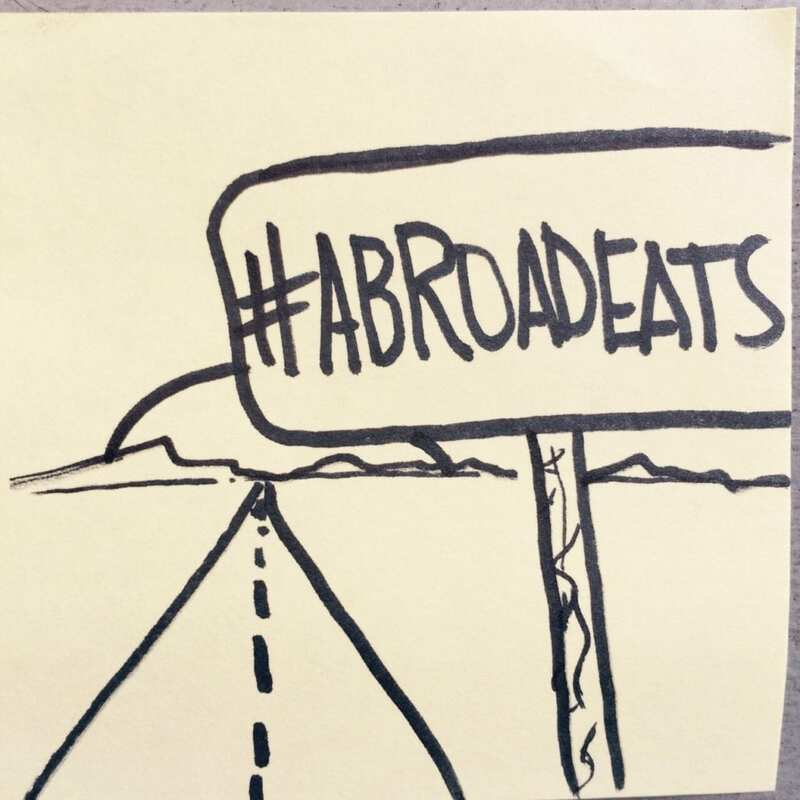 #ABRoadEatsMesa Must trys. . . . Bosa Donuts, Ted’s Hotdogs and Nando’s Chandler location…..yummy!!!! #ABRoadEatsHSV In Huntsville check out Papa Gyros for some great mom and pop Greek food. If Todd’s BBQ is still around he had some wonderful pulled pork and the best white sauce in the South. Enjoy Huntsville it was a great place to spend a couple years. 1. “Drift Seafood and Oyster Bar ” in Marietta. Same owner as “Seed..” ‘Enough said. 2. Colonnade and Mary Macs – where natives and celebrities have continued to return for authentic Soutern food for decades. 3. Stilesboro Biscuits on Stilesboro Rd. – large, flaky, best biscuits ever. Only open on mornings and on the third Saturday every month a great bluegrass band plays in this tiny shack on the side of the road with a line out he door! 4. Nuevo Laredo- best mole sauce and Mexican food in the ATL. Astoria OR- Drina Daisy Bosnian Restaurant. Traveled the Oregon coast and found this restaurant. The goulash and cabbage rolls were amazing. My husband thought the goulash was a religious experience. Give the place a try if your in that neck of the woods. PS Zip lining in nearby town of Warrenton amazing. I have no reason for you to come here other than I want to meet my hero in person. On an honest note you’re the reason I started cooking and love cooking. I can’t thank you enough, Alton.